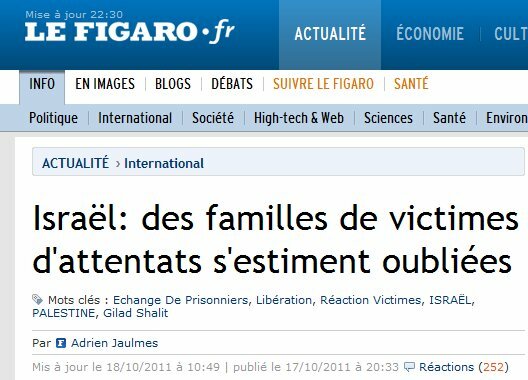 The entire interview - in French - under the title "Israël: des familles de victimes d'attentats s'estiment oubliées" is here on the Le Figaro site. In unofficial translation, Roth is quoted saying: "We are neither hysterical nor political activists, but are simply very opposed to this proposed release on principle." 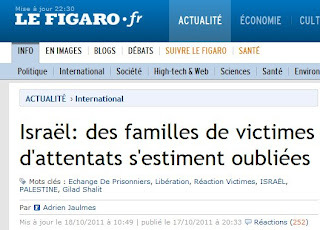 Le Figaro is a French daily newspaper founded in 1826 and published in Paris. It is one of three French newspapers of record, with Le Monde and Libération, and is the oldest newspaper in France. It is also the second-largest national newspaper in France after Le Parisien and before Le Monde.